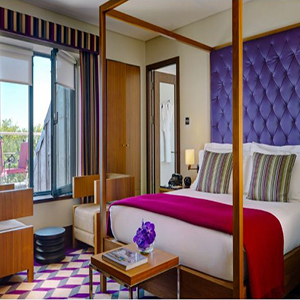 The Fitzwilliam Hotel Dublin is the ultimate in contemporary style and Irish warmth and is located at the heart of Dublins fashion district. 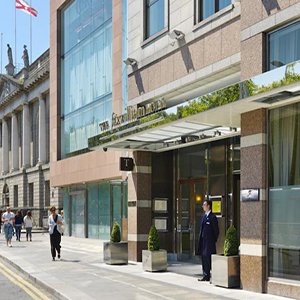 The Fitzwilliam hotel, Dublin, is a 5 star luxurious hotel located in the heart of Dublin's main shopping district and overlook the beautiful St. Stephen's Green park. If you are visiting Dublin and want to appreciate everything Ireland's capital city has to offer, the leading cultural, historical, and leisure attractions are located on the doorstep of this amazing hotel. The 5 star Fitzwilliam hotel offers luxurious accommodations in Dublin city centre Ireland, the rooms at this hotel feature baths and power showers, anti-mist mirrors, luxurious bathrobe, slippers and H20 toiletries, LCD TVs, iPod compatible music systems and free internet connections. Discover more! One of the most popular destinations to enjoy a fine dining in an elegant atmosphere is Michelin-starred Thornton's Restaurant, which is overlooking St. Stephens Green. Also on the mezzanine level, Citron serves modern Mediterranean cuisine. The Inn On The Green at the Fitzwilliam hotel is one of Dublin's coolest city centre bars where hotel guests mingle with locals and business people, it offers great food on hand all day as well. The Inn on the Green welcomes a selection of performers and always there are great deal of music for you to enjoy your stay. The hotel is ideally located in Dublin city centre with close proximity within city's major concert and music venues such as 3Arena, Bord Gáis Theatre, Olympia Theatre and many more, Gaiety Theatre is located just a minute by wlalk. The hotel features a compact gym that has everything you need to keep your exercise regime going, including aerobic machines and free weights. You don't even need to book it - just use your room key whenever you like. Also this hotel is located just a 15-minute walk from two of Dublin's major sporting venue, the Croke Park and the Aviva Stadium. This luxurious 5 star hotel in Dublin 2 Ireland features great facilities and offers best service for a business meeting, event, conference, product launch, function or celebration.